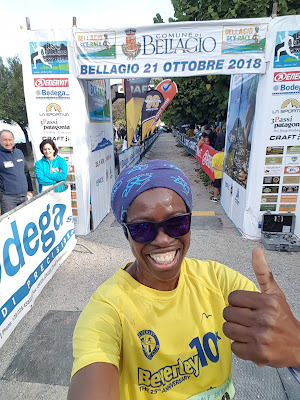 2Wheel Chick: Trail running in Cheshire, Yorkshire and in Bellagio Skyrace too! Trail running in Cheshire, Yorkshire and in Bellagio Skyrace too! Over the summer and into Autumn I really got into trail running. It was spurred on by my failed attempt to make it to the Paris marathon. Having done all that training, only to not use it I wanted something else to look forward to this year. 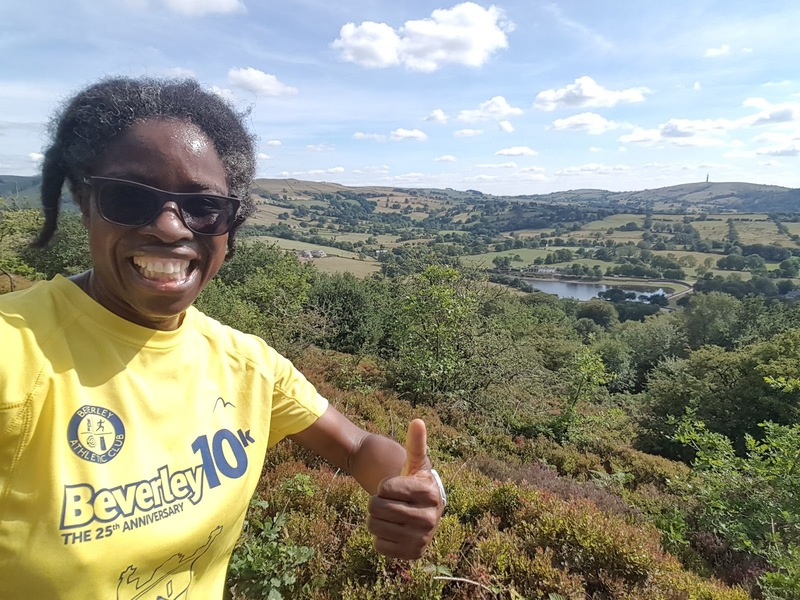 I had considered doing a mountain marathon, but orienteering with the prospect of getting deserted on a mountain in Cornwall or the Lake District didn't fill me with excitement. Eventually I plumped for the Beachy Head Marathon, which struck a good balance of being a challenge, while having signage. Also, with this being a trail run through the South Downs, I would never be that far away from a town or public transport that would get me to Eastbourne or Brighton. So with this challenge ahead, I did a fair bit of trail running - around the North Downs, along the Pilgrim's Way, and of course the South Downs - around Devil's Dyke, Ditchling Beacon, and Queen Elizabeth Country Park. Earlier in the summer I did a run in Cheshire around Macclesfield Forest and Teggs Nose Country Park. 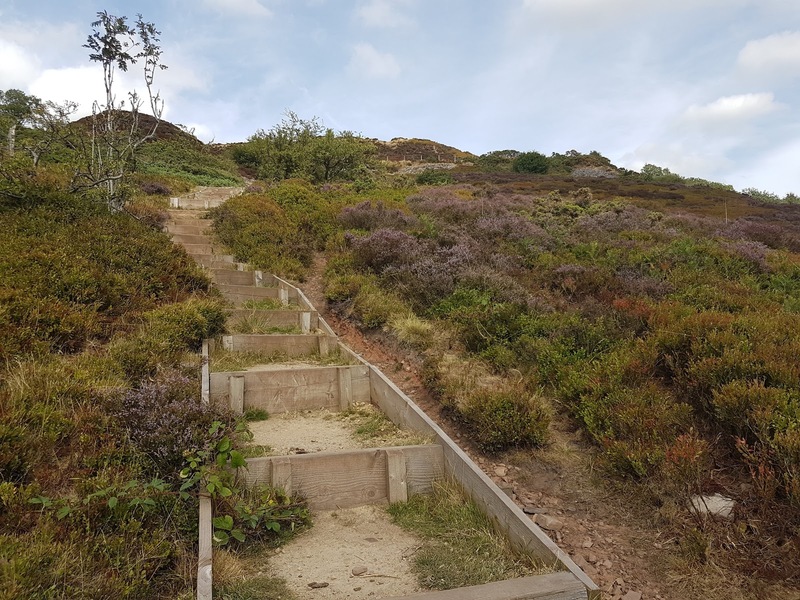 I had been hoping to take part in a fell race that was organised in conjunction with the Sheep Dog Trials, but traffic got the better of me and I missed the start, so did my own improvised run instead, which included going along the Gritstone Trail. It was my first stab at doing a trail run with a very steep gradient, and I loved it. Teggs Nose Staircase - a lift would've been nice! 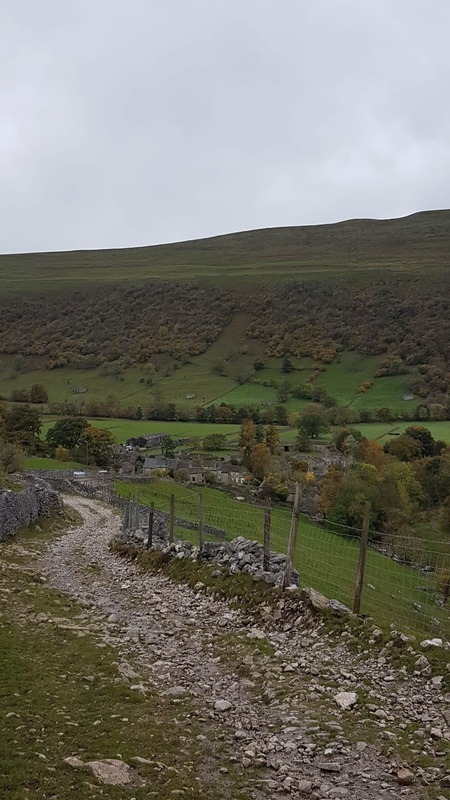 Then a couple of weeks ago while on my trip to Cycle Expo Yorkshire I did a run along the trails of the Yorkshire Dales at Kettlewell. The initial part of the route went up the dreaded tarmacked climb that cyclists know as Park Rash. I then left the road to go up a steep bridleway up to the stars - well actually to Starbotton. 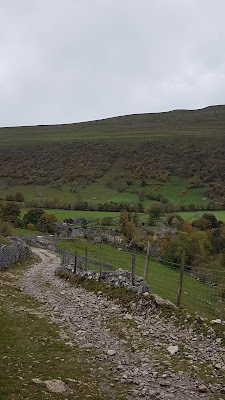 From there I returned to Kettlewell along a valley trail that was part of the Dales Way. It was a lovely run, especially as it was early on a Sunday morning, and with no one around at this point I had the place to myself. I felt lucky too, because there had been a forecast for heavy rain, and I had gone out expecting to get drenched. But somehow the rain stayed away, and only began as I was going up the steps to enter the Youth Hostel. The rain did get very heavy though, meaning that when I arrived in Harrogate later that morning to take part in the cyclocross race I knew it was going to be a mudbath - and it was! The following weekend I was in Milan for a weekend of cycling and running. It was mainly cycling that I did, but the most memorable event for me was a trail run called the Bellagio Skyrace. I had been a little apprehensive about the competition because I had not done much of this sort of racing before - not even in the UK. It wasn't the distance that was the problem, but the altitude gain. Looking at my Garmin records none of my runs had included more than 500m of climbing, and I was going to be doing double that amount. This could potentially kill my knees or my Achilles tendons, or both, as well as any chance of running the Beachy Head Marathon the following week. Would I be able to get around the race before the organisers packed away the signage and the finish gantry? Was this a really silly thing to do, entering this race as a non-fell runner? I was about to find out. Around 600 of us lined up in the main piazza of this beautiful town on the shores of Lake Como, and at the gun we sprang out of the blocks running uphill into the forested peaks of this area known as Lario (latin for Como). Half of us were all set to do 14km with 1000m of climbing, while others were doing 28km with 1900m of uphill. Actually, everyone else set off at a fast enthusiastic pace, but I was quite conservative, conscious of the need to not go into the red, and save something for later. Also knowing that I would be running a trail marathon the following week, I really didn't want to wreck myself. So, it must have looked a bit odd in front of all the townsfolk who had come out to watch us, seeing me all in race gear and with a number on, some 50 metres off the back of the pack. I wasn't going to let these things bother me though. The only problem was the road twisted a bit and at a crossroads, I had to ask some passers-by which way the other runners had gone. For a time we were running along a road I was familiar with, as it was the cycle route up to the Madonna del Ghisallo sanctuary that I had ridden the previous day. Once we left the road and started running up the trail I began to catch people as a bottle-neck occurred and things were at a stand-still. Also, many people had already started walking as the trail became increasingly steeper. My plan was to run as much of the course as possible. I was able to do so for the first couple of miles, which went along a wide stony trail and then through a field. As we got deeper into the forest, the trail became steeper as it zigzagged through the trees. It also became narrow and so we were reduced to walking as a single-file procession. I would have run it if I could but it was too much energy to try and squeeze past people. In any case the path was so steep that I wouldn't have been able to run much faster than walking pace along this section. The forest was beautiful, and it was great to be able to run through these trees that normally people only tend to see up in the distance at lake level. Glad to reach the summit - and some wine was waiting just around the corner! Once at the summit on Monte Nuvolone we ran through a specially erected gantry, marking the 980m above sea level apex. From here it would be a short distance along the plateau before making our way back down to Bellagio. 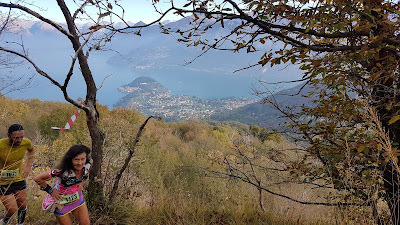 I must say that although this was a race I felt that it would be wrong to come all the way over here without stopping to admire the view of Lake Como from an angle that I rarely get to see. For this reason I stopped and took a few photos. In fact quite a few times I stopped to take photos, meaning that I lost a bit of time on the various people I'd managed to overtake, though I managed to catch them up as they continued to walk, while I chose to run. Further along on the plateau of Monte Nuvolone I stocked up my energy levels at the feed station ready for the descent, which would be taxing on the legs. The marshals at the top jokingly asked me if I would like some wine. I thought they were being serious (especially as I had previously drunk six glasses of wine at the Bacchus half marathon some weeks before). So I accepted the offer, thinking it was just a normal thing to do during races in Italy. But when they looked at me with a mixture of bemusement and incredulity, I realised this wasn't quite normal. They obliged by serving me a glass of Montepulciano d'Abruzzo, probably thinking I was an alcoholic or something. I just happily downed it in one before continuing my run. Soon I regretted drinking wine as I was faced with a very tricky drop across some boulders. There were ropes cut into the rocks that we could hold onto, but I didn't really trust them and preferred to hold onto the ground to steady myself. Although it was only a short stretch, I found it a little unnerving. The mountain rescue team were on hand, giving tips but I felt more comfortable negotiating this stretch in my own way - even if it looked unelegant being on all fours. Apart from that slight difficulty, the run back into Bellagio was straightforward technically provided you kept an eye out for the tree roots in the woods, and put your foot in the right places when running over the rocks, stones, and rocks on the stony trail, and you didn't bump into the trees or field furniture along the way. By this time the number of runners had thinned out from the feed station onwards, with half the field having continued on to do the 28km-course up to Monte Primo (the hightest peak in the area), so it was easy to just settle into a natural pace and not have to worry about anyone on your tail, or trying to get past people. At this point in the race I felt fine physically, and not particularly fatigued which was a good sign. I had run very much within myself, which was what I had wanted to do. The final run back into the finish line was on a gravel path along the side of Lake Como with lots of people - spectators and tourists - giving encouragement along this home straight. It felt quite special. On this comparatively smooth stretch I was able to put in a bit of a sprint, so that in front of the spectators I might look a bit more athletic than I did on the outward run through the town. As I neared the finish line, the crowd cheered avidly, and that made me put in an extra spurt. Then I realised they weren't cheering for me, but for the first finisher of the 28km route! 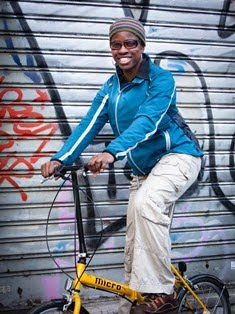 The winner was a guy from Rwanda who had basically run exactly twice as fast as I did. Hey ho! At the finish line I congratulated one or two of the other runners I'd taken turns with overtaking through the race, and discovered that one of the runners was a woman from Fulham Running Club. She was there with a fellow club runner Daphne, who had finished a good few minutes ahead of us, and some other club mates who were doing the long route. I was just so amazed to see other people from the UK doing this. Normally when I go to races abroad I end up being the novelty competitor from London. So it was good to meet others who'd had the same idea as myself. They invited me to dinner with them at their place near Bellagio, but I had already arranged to meet people back in Milan, so had to decline. Hopefully I'll see them at another race in the area in future. This was definitely a fun race to do. Anyone who does regular trail runs or fell running would find this a breeze, and would probably prefer to do the 28km race. If you're not a trail runner, but run regularly the 14km is still doable, and on the really steep bits a lot of people walk it anyway. 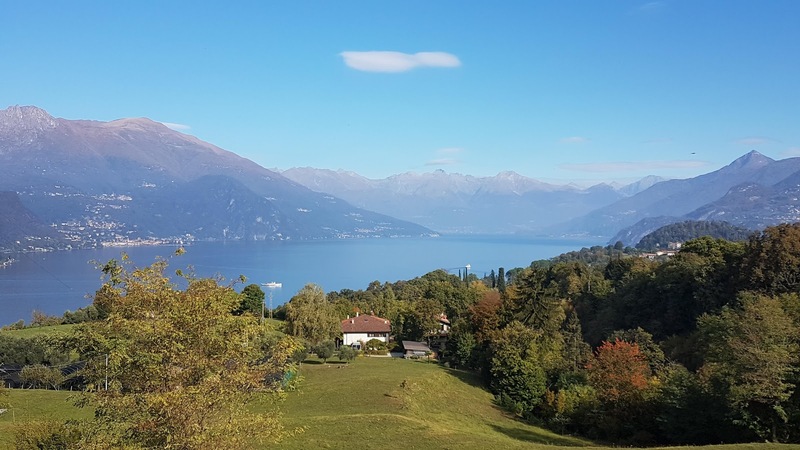 It is one of the most beautiful locations you could choose for a running race, and it was well organised. 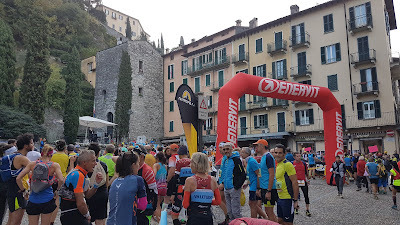 Even for the post-race pasta party the marshals provided table service and you had a view of Lake Como as you wolfed down your farfalle followed by polenta, with wine. My apprehensions about the race had been completely for nothing. It had all been pretty straightforward, and had definitely set me up nicely for the Beachy Head Marathon. I can't believe I made the cut for this video. I can be found somewhere at 3mins 45, just after Daphne! 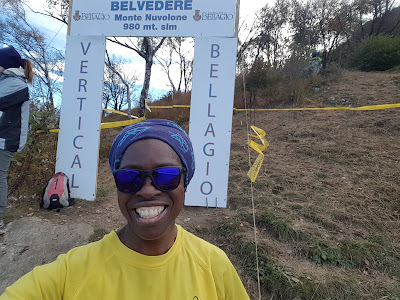 BELLAGIO SKYRACE 2018 - Official Video from URBANPRODUZIONI on Vimeo.